Florida protests build towards march on the RNC | Fight Back! Tampa, FL - Across Florida, groups with the Coalition to March on the RNC protested as part of a statewide day of action on July 27. The day marked a one-month countdown to the Republican National Convention (RNC) and the massive unified march and protest happening on Monday, August 27, in Tampa. Groups across the state and around the country will be coming down to Tampa as part of a broad coalition saying no to the Republican agenda. The Coalition is promoting a people’s agenda demanding, “Good jobs, healthcare, affordable education, equality and peace.” The group is protesting on the opening day of the RNC and demanding that government money be used for human needs, not for corporate greed and wars overseas. In Tampa, leaders from Students Working for Equal Rights, Tampa Bay Students for a Democratic Society, Fight Back Florida, members of Teamsters Local 79 and Occupy Tampa gathered at Perry Harvey Sr. Park. This is where the march on the RNC will begin with a rally at 10:00 a.m. on August 27. Organizers waved a huge banner that said, “Be here August 27th to demand: Good jobs, Healthcare, Affordable Education, Equality and Peace.” The Coalition to March on the RNC leaders spoke to the media about the recently granted permits, as well as details of the march and rally. They plan to continue to gather support from the community as the massive protest draws near. 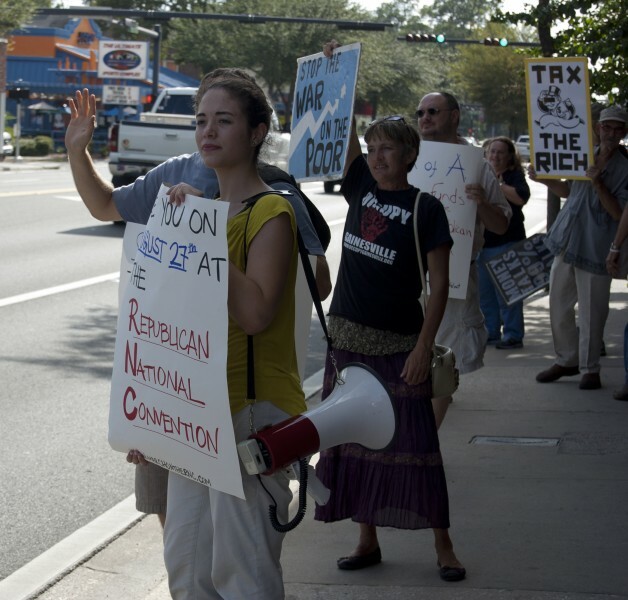 Later in the day, the Coalition to March on the RNC in Gainesville protested outside of the Bank of America chanting, “Banks got bailed out, we got sold out!” 30 protesters gathered from Gainesville area Students for a Democratic Society, Occupy Gainesville and Veterans for Peace. They rallied outside of the bank where Jeremiah Tattersall said, "Bank of America funds the parties of the 1%. We'll be following their money to Tampa for the RNC, but also to Charlotte for the DNC." Protesters then marched to a busy intersection, waving signs and chanting. Around the country groups and people are mobilizing for the Tampa protest against the Republicans and the wealthy 1% who own and control both political parties. The Coalition to March on the RNC plans to protest within sight and sound of the Republican convention. They also support the March on Wall Street South during the Democratic National Convention a few days later. After the opening rally on Monday morning of August 27, the Coalition will march through the streets of downtown Tampa to “Protest RNC Square” for another rally outside of the Tampa Bay Times Forum to oppose the Republicans and their 1% backers. A united message of struggle and progress, carried by thousands who are part of a growing movement in the streets and work places, will be heard across the country and perhaps the world.